Our beautiful LED candles are made from real wax making them hard to distinguish from traditional candles. 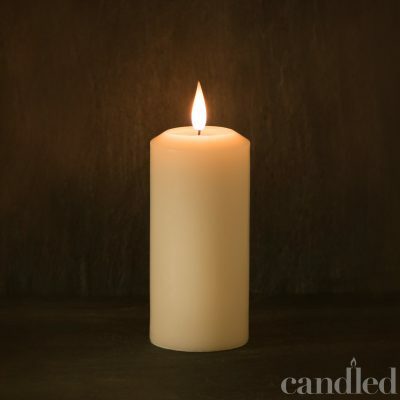 The light output is virtually identical to a real candle, creating a beautiful warm fire glow, around the room. Remote control included with each candle. Free P&P on orders over £75.00 for UK mainland only. Our beautiful LED candles are made from real wax making them hard to distinguish from traditional candles. 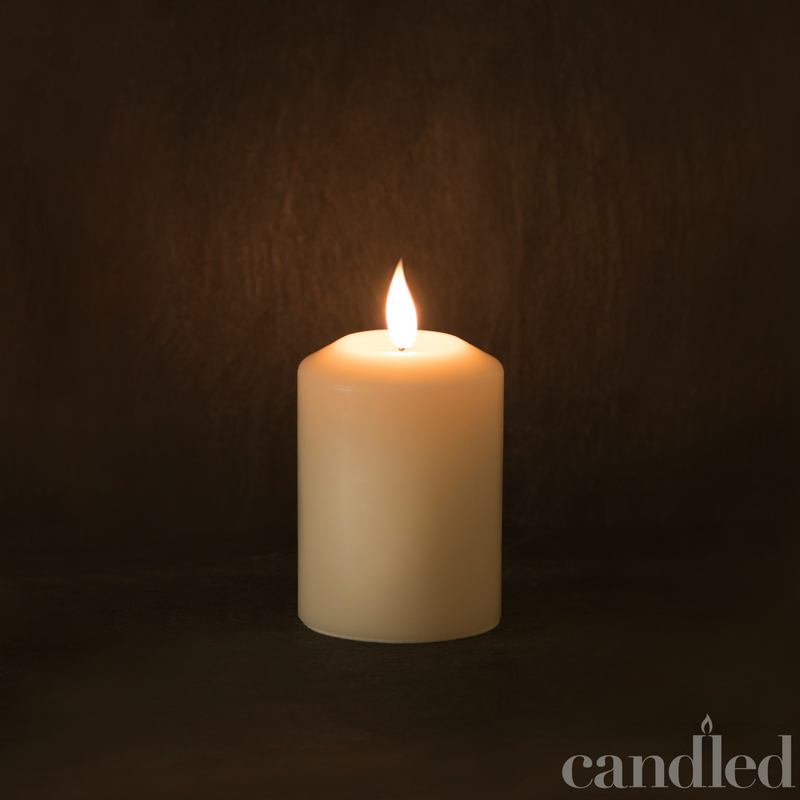 Candled have created a realistic fire safe candle like no other currently on the market. Each LED Pillar candle has a very realistic molten wax pool around the wick and a slight blue /grey to the bottom of the flame, just like a real candle. Our pillar candles also have a cream felt ring on the base to protect surfaces which completes each candle to our high standards. 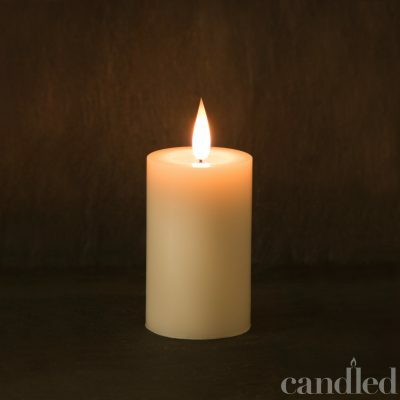 The light output is virtually identical to a real candle, creating the beautiful warm fire glow, around the room. 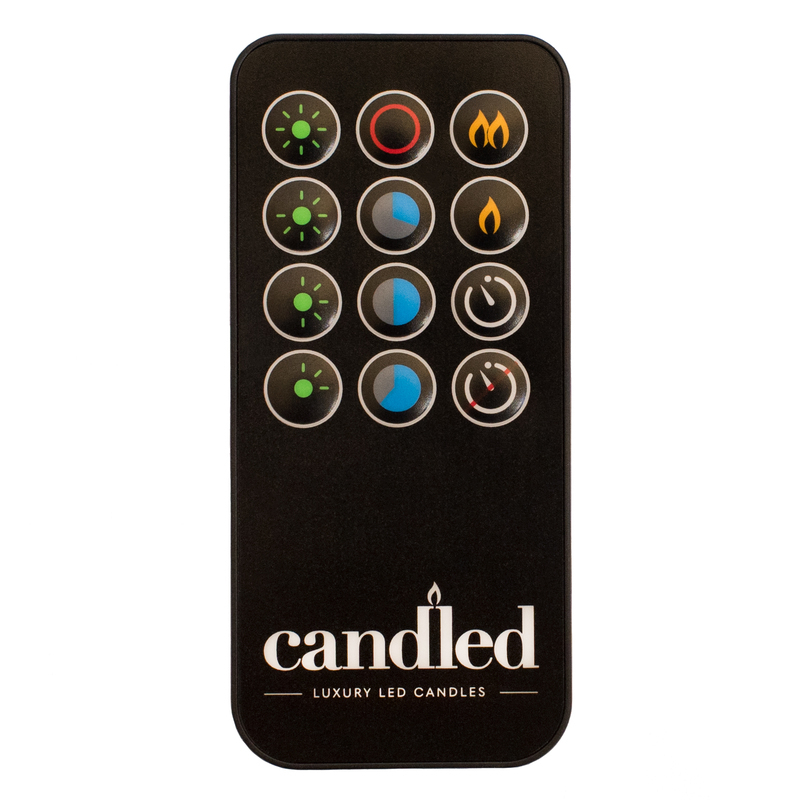 Remote Control – The LED candles are controlled by a remote control. On the full brightness setting, our 12″ taper and 4″ pillar candles can run for 50 hours on a single battery charge, our 6″ & 12″ pillar candles can run for 125 hours and our 10″ taper can run for 35 hours on a single battery charge. Each LED candle has 4 brightness settings to suit any mood. The LED candles are never dull even when batteries are starting to lose charge – they stay bright to the last energy in the battery. Each LED candle has a 24-hour timer setting, which can be programmed to come on and switch off at a desired time each day. Each LED candle has a full 1-year warranty with no quibble replacement. 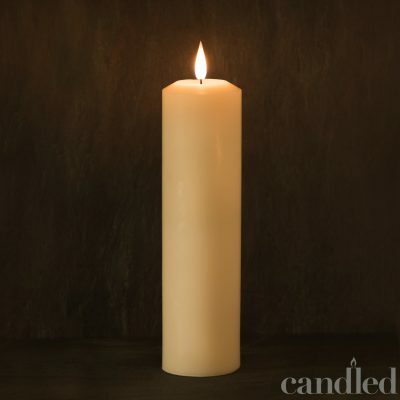 Our candles are made from a unique blend of high quality wax, producing a beautiful cream finish. Before each candle is dispatched it is tested to a very high standard. NOTE: We have designed and developed a high powered remote control ideal for chandeliers in tall buildings as it has a 50 meter range or for large rooms with lots of candles in. Designed and manufactured in Devon using high quality components to create the mesmerizing flame effects, all our candles are made with our own blend of quality wax with an elegant life like flame. Our customers already include National Trust properties, Princess Yachts, Luxury Glamping sites and Wedding venues.